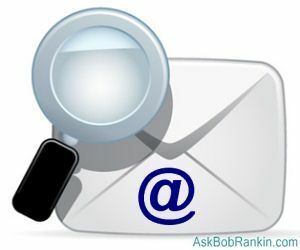 Email Tracking - Does it Work? Some email programs, such as Microsoft Outlook, include features that deal with email confirmation. When you compose an email in one of these email programs, you can select an option like "delivery confirmation", "return receipt", or "read receipt". Email confirmation requests are attached to the email that you send. What happens to them varies. Email delivery confirmation asks the receiving system to confirm email delivery by sending you an email saying, in effect, "Your email made it into the addressee's inbox." The addressee is not involved in this sort of email confirmation and never knows about it. Delivery confirmation is like sending a paper letter via certified mail. You get confirmation of delivery, but you don't know if the letter gets read. However, the receiving email server may not be configured to reply to delivery confirmation requests. In fact, most email servers are not; their administrators are concerned with their customers, not with senders of email. They don't want to waste processing power or bandwidth on delivery confirmation emails. A read-receipt request pops up a window in the addressee's email program when he or she opens the email. It says you requested a read-receipt and lets the addressee decide whether to give you one. Many email recipients find these pop-ups annoying and disable them, rendering read-receipt requests useless. Also, if the recipient is not using an email program that supports read-receipts, he or she won't see a request for one. No web-based email interfaces support read-receipts or delivery confirmation. And LOTS of people use web-based email these days. Email tracking programs such as DidTheyReadIt? and ReadNotify try to solve the problems of email confirmation in various ways. One method is called a "Web beacon." If you use HTML email, a link is embedded in it that references a tiny one-pixel image file called a "Web beacon" on the email tracking service's server. When the email is opened, that link automatically fetches a copy of the image, and that event tells the email tracker that the email was opened. The email tracker sends you a read-receipt email. But several conditions can prevent the Web beacon from working. If your addressee reads mail in plain text format instead of HTML, the Web beacon image file won't be fetched. If the addressee's email program doesn't automatically download image files in HTML mail, the Web beacon won't work. Microsoft Outlook and other popular email readers are configured by default to NOT download image files for security reasons. If the email is automatically forwarded from one address to another before being read, the Web beacon won't work. So there is still great uncertainty about third-party email tracking services. One thing to consider is that these services (even if they can't provide an indicator that your email was opened) may be useful in proving that an email was actually sent. But in the escalating war on spam, many "good" messages are erroneously sent to email blackholes, so even if you can prove you sent it, you still can't know for sure that an email was actually delivered to the recipient's inbox. Unless they reply, of course. Email tracking services cost $25-$50 a year, and they really don't work with absolute certainty. Bottom line, the problem of email confirmation remains unsolved as long as recipients choose not to reply. Unfortunately, your best bet is still the low-tech "pick up the phone and ask" option. Most recent comments on "Email Tracking Programs"
Your article is make a good point. I think it is only reasonable that people know when a message is delivered. After all, I can do this with paper mail, so why not with email? While email servers don't all support this feature, there are other services that do. One is TrulyMail which is really an e-mail replacement. Since webmail (hotmail, gmail, etc.) never supports return receipts, I don't see how someone can ever be sure all messages are received. Some tools allow readers to unblock only some remote images while showing others. Of course, web beacons would never be unblocked by a user... unless they did not understand what they were. Depending on ignorance is rarely a long-term solution. I have been using an email tracker for years now. It has a free version and a paid version that has worked well for me. I love it. Yes you are not sure someone has received you email and most don't like sending a confirmation of receipt. The program is Message Tag or MSGTAG. There is a free version and a paid version that has a few more features. I have the paid version and I only paid once - years ago - and couldn't live without it. My longest response time was almost 3 years! when it returned the tag. Where do the messages go? Very simple way to make sure your message was opened (read is a different thing): send it using one of the many greeting/wishing cards sites like hallmark or bluemountain who will return you a message at what time/date the message was opened. The biggest problem with email (and snail mail) is you don't really know who read the message. Just because msgtag says the email was delivered doesn't mean it went to the actual recipient. An email sent to *MrBigShot at whatever dot com* doesn't mean he ever read it. A secretary might have the password to open his email account, screen the messages, and forward only those she deems important enough to merit MrBigShot's attention. ReadNotify (et al) is pretty good but with the advent of Vista and now Win 7, I found that my emails were being flagged as suspicous. Therefore a waste of time given the growing number of post-XP systems there are around. Interested in MSGTAG though. I'll try it out. EDITOR'S NOTE: Ummm, does that have something to do with email tracking? I'm not sure what you're trying to say. "Your message has been received by, and displayed on the screen of the recipient. We cannot tell you if the recipient read it, or if read, the recipient understood it." It was like they knew my father-in-law! I use the standard Outlook asking for delivery/receipt confirmation and most people are pretty good about it. What I find interesting is the lag time between sending out say new price lists to dealers and the time it takes them to open them.I am always right on my E mail but what do you think of a guy who takes four months to open yours? Not too interested? And who waits four months before opening an e mail today? I'm not a techie, but it's kind of amazing to me that this problem hasn't already been resolved. I'll bet the bad guys would solve it in no time if it was in their interest to do so. I'm not a techie, but it's kind of amazing to me that this problem hasn't already been resolved. It WAS solved -- with "Read Receipts" -- as nearly as it ever could be, in the original E-Mail standard. You can thank the Bad Guys for UNsolving it for everybody. Would you please help me with new and different service ? You should also check out ContactMonkey (www.contactmonkey.com). Email tracking for Outlook, Gmail and Salesforce.com. It's ridiculously easy!